[186 Pages Report] The top 10 analytics technologies market is expected to grow at a significant rate during the forecast period. The base year used for this study is 2014/2015, and the forecast period considered is between 2015 and 2020/2016 and 2021. The objective of this study is to define, describe, and forecast the top 10 analytics technologies markets on the basis of various segments and subsegments. It provides a detailed information regarding the major factors influencing the growth of each market (drivers and restraints). It also includes the profiles of the key players and analysis of their recent developments for the specific analytics technology. This research study involved extensive usage of secondary sources, directories, and databases such as Hoovers, Bloomberg Businessweek, Factiva, and OneSource to identify and collect information useful for this technical, market-oriented, and commercial study of the top 10 analytics technologies markets. Along with that, a few other market-related sources such as CIOReview and white papers have also been considered while conducting extensive secondary research. The primary sources are mainly several industry experts from core and related industries and preferred system developers, service providers, system integrators, resellers, partners, standards, and certification organizations from companies and organizations related to various segments of this industry’s value chain. In-depth interviews were conducted with various primary respondents that include key industry participants, subject matter experts, C-level executives of key market players, and industry consultants, among other experts, to obtain and verify critical qualitative and quantitative information as well as to assess future prospects. The major players in the market for top 10 analytics technologies include IBM Corporation (U.S.), Oracle Corporation (U.S.), SAS Institute (U.S.), SAP SE (Germany), Microsoft Corporation (U.S.), Dell Technologies, Inc. (U.S.), Cisco Systems (U.S.), Hewlett-Packard Enterprise (U.S.), GoodData Corporation (U.S.), and Informatica Corporation (U.S.). The end users of these analytics technologies are from BFSI, retail, government, healthcare & life sciences, manufacturing, telecommunications & IT, and other sectors. 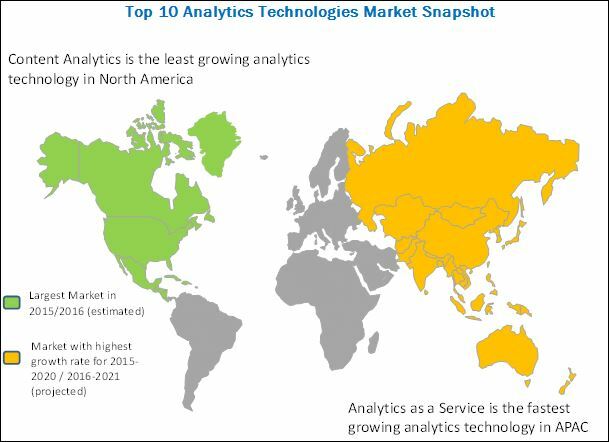 The top 10 analytics technologies market is expected to grow at a significant rate during the forecast period. The growth of this market is propelled by the advent of IoT and proliferation of massive amounts of data through connected devices, increasing focus on competitive insights, need for increased business agility and scalability, and growing volume and variety of business data across industry verticals. This report categorizes the top 10 analytics technologies market on the basis of software, service, data type, business function, application, industry vertical, and region. The market for analytics as a service is expected to grow at the highest rate during the forecast period. The analytics as a service market is expected to be the next big thing in a few years. The analytics market evolution started with the digital support system and data warehouse, followed by the introduction of mainstream analytics, analytical tools, and finally, analytics as a service. Organizations adopted the analytics as a service solutions to save time and cost associated with the traditional on-premises analytical and BI platforms. An evolution from on-premises BI platforms to cloud-based BI is marked by the development of analytical tools and advantages, such as effective decision-making processes and enhanced Return on Investment (ROI), for all potential users. Streaming analytics is another analytics technology that promises huge opportunities for diverse business applications in the current era. Streaming analytics is used widely by major industry verticals such as BFSI, retail & e-commerce, telecommunications & IT, transportation & logistics, energy & utilities, government & defense, healthcare & life sciences, manufacturing, media & entertainment, and others (outsourcing services, education, and travel & hospitality), for different business needs. Some of the major applications of streaming analytics include fraud detection, sales & marketing management, predictive asset maintenance, risk management, network management & optimization, location intelligence, and operations management. The unexpected growth in the adoption of sources such as sensors, mobile devices, and networks has resulted into an exponential increase in data volume, which will increase the demand for streaming analytics across organizations. In 2015/2016, North America accounted for the largest share of the top 10 analytics technologies market. In addition, the presence of major industries and advancement in latest technologies are the factors that drive the demand for analytics technologies in this region. Europe accounted for the second-largest share of the top 10 analytics technologies market, while APAC is expected to have the highest growth rate in the top 10 analytics technologies market. This report describes the drivers and restraints pertaining to each analytics technology in the top 10 analytics technologies market. In addition, it analyzes the current scenario and forecasts the market size till 2020/2021.